Flexibility is a primary feature of Pacproinc®’s Bacon Systems. Configurable for lay-flat or bulk bacon, these interleavers/counters/stackers perform high-speed, automatic paper placement while centering product (side-to-side) on the interleaving paper for improved arrangement quality. Automatic stacking dramatically improves stack quality when compared to manual stacking. 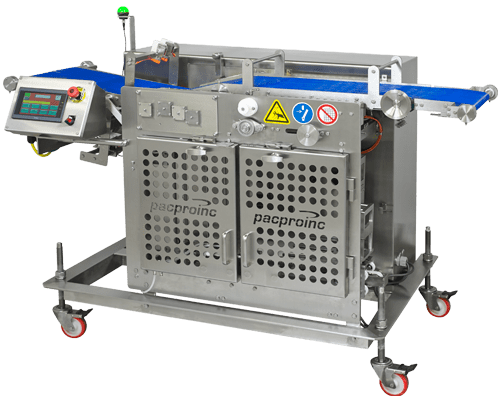 The Pacproinc® Bacon System can produce up to 3300 lbs of lay-flat bacon per hour, and a high-speed downgrade diverter interfaces with vision slicers to automate the grading process and guarantee that downgrades are not combined with number one bacon. Auto stacking is better for the bottom line, as well; the PPI-200 Bacon System reduces labor, training expenses, and repetitive motion injuries while cutting operating costs and improving product packaging and presentation. The PPI-200-SS-CD feeds up to 80 cards/minute and is guaranteed to reduce downtime associated with missed cards, double feeds, and jams. The Stack Pack-off Conveyor Option combines the flow of stacks from our Dual Station Star Wheel Stackers into a single flow for downstream automation and labor reduction. This optional conveyor can be paired with our High Speed Food Service Bacon Automation System to feed directly to a boxing station or a Form/Fill/Seal Gas Flush Packaging Machine. Additionally, the single flow of products allows for more ergonomic scale operation and may only require a single scale operator.